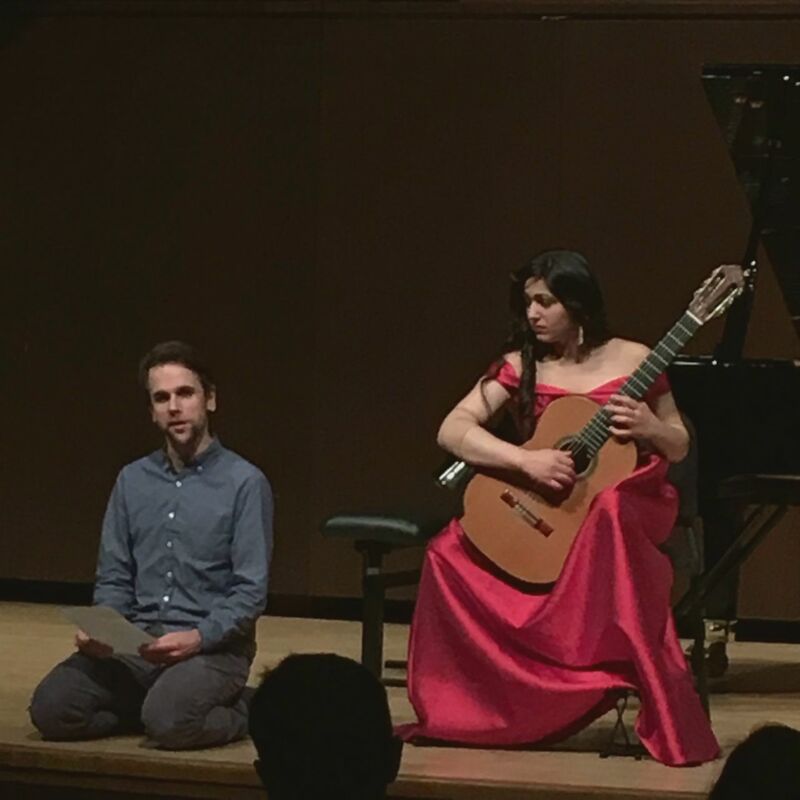 When guitarist Alberta Khoury, who’s a fourth-year student in the combined bachelor’s and master’s program, had a Gluck Fellowship, she performed at healthcare facilities. “I saw audiences who were terminally ill listening to an hour of Bach when time was so precious to them,” she says, and she realized “we cannot underestimate the curiosity and interest of our listeners.” A few years later, at a performance she gave in Chicago, she asked the audience members for questions—and found they were both curious about the complex program and thrilled to be asked. 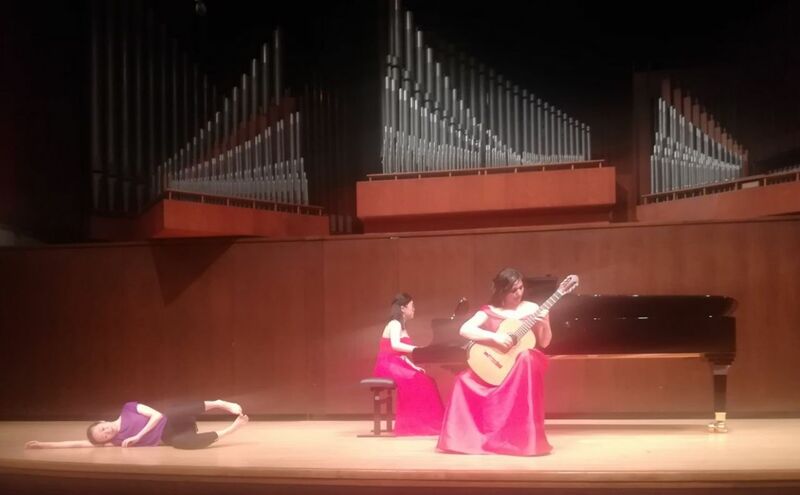 These experiences and others inspired Khoury when she was planning her Juilliard recital this fall. People like coming to concerts, they just need incentive from offstage interactions with the performer. Last year I had the pleasure of doing a shared recital with one of my closest friends, pianist Anran Qian, who’s now a fourth-year. I wanted it to be a special experience, and from repertoire to publicity, I pushed the envelope and tried new approaches. First of all, our piano and guitar combination for a shared recital was unique. Usually pianists join with other pianists or occasionally another instrumentalist. We also decided to include students from all three divisions to form a collective performance. Having been encouraged to compose by my previous theory teacher, Behzad Ranjbaran (MM ’88, DMA ’92, composition), I wrote a piece for guitar and narrator—fourth-year actor Scout James—and another piece that third-year dancer Can Wang choreographed and danced. I wanted the theme of our recital to represent how Anran and I both love music, life, and people. I like looking at things from a bigger social perspective and feel the world could do with more love and care. Therefore we wanted to demonstrate how Debussy, Ravel, and other composers would interpret love in our program. My ideas about publicity and promoting the concert stemmed from our theme—passion. I opened up our concert to as many people as I could, hoping to express my care and respect for them, and the experiences we had publicizing it revealed so much insight about the arts and what being a performer entails. Initially we thought about creating posters and posting the concert as a Facebook event, but I felt an audience shouldn’t just consist of friends and colleagues. So I created small flyers with a QR code of a video, giving potential audience members a snapshot of the evening. The Metropolitan Opera was our first stop: we handed flyers to audience members leaving an evening performance. Unfortunately they didn’t take our invites seriously, but I had a feeling there must be other ways. "I approached another cafeteria staff member and handed him a flyer. Then he said, 'I’ve worked here 26 years and nobody has ever asked me to come.' I was gobsmacked." What about the people in our building—the staff, teachers, workers, chefs, and, cleaners who make our lives here a comfortable and pleasant experience? So I set out to visit every office I could find in Juilliard, and meeting new people was magical. One of my favorite responses was from Martina, who makes the delicious sandwiches at our cafeteria and always brings a smile to people’s faces. I invited her and she insisted I give her more flyers saying, “I’m going to bring all my friends and we’re going to make sure you see us!” I hadn’t witnessed enthusiasm like hers before, even from fellow classical musicians. Another encounter left me in a bit of a daze. I approached another cafeteria staff member, stacking items in a fridge, and handed him a flyer. At first he was startled. Then he said, “I’ve worked here 26 years and nobody has ever asked me to come.” I was gobsmacked. Hundreds of recitals happen in Juilliard and this man had not been invited to a single one? You can imagine the thrill I had seeing the worker in my audience of 50, coming from a long day of work. I asked cleaners working outside of Paul Hall. They thought I was inquiring about using the hall. I asked maintenance staff and they thought I was in the wrong office, but I wasn’t—they were just the people I was looking for. I went across the street and asked the ticket sellers at the Elinor Bunin Munroe Film Center. Again, there was confusion, but then they were absolutely delighted. Nothing made my day any better than the salesmen at Best Buy. As my friend and I left the store, we stood outside watching sales people staring down at the flyers for a long time, curious about the event and the invite. One thing I really did learn from this entire experience was the only thing limiting ourselves is our imagination. I don’t believe art is dying if the responses I received were as enthusiastic as the ones I described. I’ve come away from this experience more excited about becoming an artist than ever. I discovered the arts and music are as alive as we want them to be. It’s tragic for anyone to think the world doesn’t need another dancer, pianist, or singer—our job just requires us to make an effort knowing our audience and be on par with them. We artists have the luckiest job in the world: bringing joy to people. Observing people from diverse backgrounds coming together and listening to someone speak through their chosen art form is a gift. We should feel privileged to have that attention. Voice Box is an opinion column and does not necessarily reflect the views of Juilliard. The Journal welcomes columns on any topic by Juilliard students, faculty, staff, or alumni. To submit, email journal@juilliard.edu.